One of the most common questions our couples ask us is how many hours they should have booked with us as their photographers for their elopement day! One of the many ways adventure elopements with us are unique to the more traditional weddings is how involved we are with your timeline planning. Typically when our couples first reach out to us, they have nothing planned other than a general location or date range (and sometimes they’re even completely open with those details!) so we come along side them right from the beginning to start planning out their elopement day(s), the activities they’ll do together during that time, the locations they’ll be eloping in, their outfits, food choices, vendors (like florist, officiant, hair + make up artist, etc! ), lodging, and so on! We joke that while we’re hired as elopement photographers, we typically fill the role of elopement planners, legal witnesses, guides, and so on. While this is based on our own experience, other elopement photographers will have differing advice. Everyone does things differently, so this guide will likely be most helpful for our own couples, although I hope everyone can find it helpful in some way! As I mentioned, these details will vary by location, activity, and each individual couple. If you’re planning your wedding with us, we will work with you individually to ensure your timeline is perfectly created to fit your needs! My biggest advice is to trust your photographer. Ideally you’ve found someone who has experience photographing adventure elopements and they can offer advice on timing, the best lighting, the best activities for you in the location you’ve chosen, and so on. A 4-6 mile (round-trip) hike out to a beautiful location, typically timed to align with sunrise or sunset, meaning half of the miles are likely in the dark with headlamps (so fun!). While the average human hiking pace is 30 minutes per mile, giving ourselves an hour per mile allows for photos along the way as well as time at the destination location for a ceremony and small celebration, as well as plenty of portraits at the destination location during sunrise or sunset. The shorter the hike, the more time we’ll have out at the location, as well as time for a picnic, champagne, cake, and so on. If the couple has guests, we reccomend more time per mile to allow for everyone to go at a comfortable pace. While hiking is the most typical activity our couples choose to incorporate on their wedding day, this can be exchanged with Jeep touring, rock climbing, repelling, kayaking, mountain biking, you name it! An 8 mile (round trip) hike. This could be for a longer day hike, one that we’d probably start super early and try to align with sunrise (which is safer to do than planning to hike 4-5 miles in the dark after sunset). This is only recommended for couples with 0 guests, or couples who are extremely confident in their guests abilities to hike! For longer hikes longer than 8 miles, we’d reccomend booking out two day package and doing an overnight trip (more on that below). With this timing, we’d be able to do your ceremony and a picnic celebration at the location, as well as plenty of stops along the way for photos. Bonus, when we’re hiking in the dark we can take some long exposure star photos if the sky is clear! A 4-6 mile hike with just the couple, as well as a relaxed ceremony + celebration with guests at a different location. We could plan the hike around sunrise and have a late-morning to mid-afternoon ceremony, or flip the timeline and have the hike around sunset following the ceremony! As mentioned above, any of the hiking options could be substituted with a Jeep tour, helicopter tour, hot air balloon flight, cooking at your campsite in the morning, or whatever else feels exciting to you! 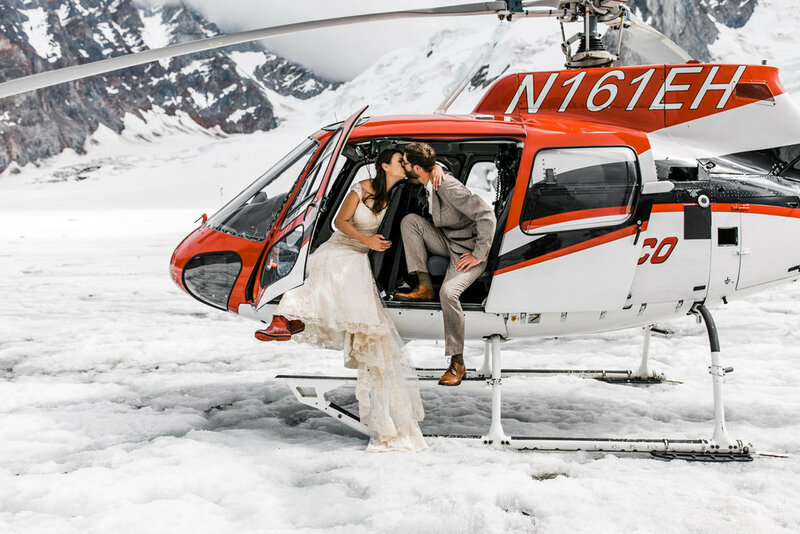 With the full elopement day booked, you can truly make the most out of your day and enjoy multiple activities, explore really far into the wilderness, or splurge on some super cool experiences in the place you’ve chosen to elope in! A day spent with guests joining on the hiking/jeeping/etc, as well as a day just the two of you doing something special together, like canyoneering, skydiving, rock climbing, or relaxing at your cool hotel (side note, have you heard of Under Canvas? DREAMY) followed by a fun adventure. Spending Day one as your “wedding day” and Day two as your “Honeymoon” and having photos of both! A fully booked expedition through a location guiding company, think kayak touring in Alaska, Glacier Trekking in Patagonia, riding camels to a desert camp in Morocco, or back country ski touring in Switzerland. Honestly, the beauty of eloping is how much control you have over your experience. There is no “right way” to do things, you essentially choose what you want to do, incorporate a meaningful ceremony to pledge your life to each other, and bring us along so you’ll have incredible photos to look back on until you’re cute old wrinkly buddies in 100 years from now :) If you’re a couple that’s booked with us and you’re in the early stages of planning, I sure hope this was helpful information for you! Please, don’t hesitate to reach out to us, ask questions, and seriously — we’re always full of new ideas! Oh, and if you’re in the process of planning your own elopement and you haven’t reached out to us yet, what are you waiting for?! E-mail me right now — let’s get to planning!